#Fukushima I Nuke Plant: Subcontractor in Namie-machi Told Its Workers to Use Lead Casing Over their Dosimeters to Protect Radiation "Allowance"
Mr. Tomohiko Suzuki, journalist who went to work at Fukushima I Nuclear Power Plant last year to report how it really was in the plant, said the workers use a variety of ways to lower (i.e. fake) the radiation exposure as measured by their dosimeters. One of the ways is to simply hand the dosimeter to a person who is not entering the high-radiation areas; another way is to flip the dosimeter in the pocket so that it won't measure radiation as much. Here's a new one, decidedly more effective. A subcontractor in Namie-machi, Fukushima who contracts work from one of the 1st-tier TEPCO subcontractors supposedly told its workers to cover their dosimeters with lead plates when working at the plant last year. It has been revealed that a senior executive of a subcontractor instructed its workers to cover their dosimeters with lead plates several millimeters thick for the work ordered by TEPCO for the restoration of Fukushima I Nuclear Power Plant last December. It was done to disguise the radiation exposure levels of the workers, whose upper limit is set by the regulations. 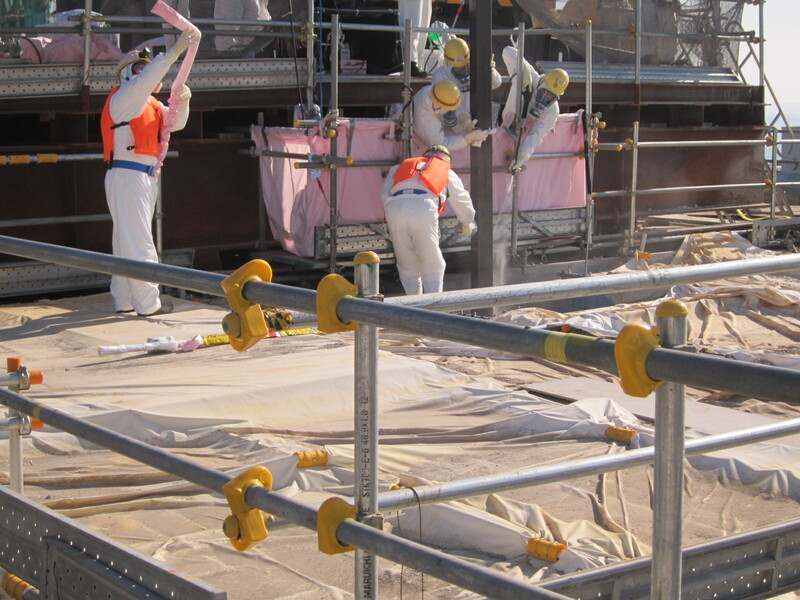 More than one worker has admitted to Asahi Shinbun that they worked with the lead cover over their dosimeters. The senior executive denies that he ever instructed the workers and that the lead cover was used. Asahi Shinbun has obtained the recording that shows a senior executive (age 54) of the subcontractor "Build Up", which is a medium-sized construction company in Fukushima Prefecture. The exchange between the executive and the workers took place at night on December 2 last year, at a ryokan [Japanese-style hotel, inn] in Iwaki City in Fukushima where the workers were staying. One of the workers recorded the exchange with his cellphone. On the previous day, the executive had told the team of 10 workers to cover their pocket-sized dosimeter "APD" with lead cover. 3 workers had refused. So on the night of December 2 a talk was held between the company [the executive] and the 3 workers. The executive denies what's in the recording, but more than one worker who were at the scene confirms the facts. Asahi's subscriber-only section has the actual transcript of the conversation that took place between the executive and the workers. Two additional articles (also subscriber-only) give the detailed background that led to this request. Reading them, I just feel sorry for the executive and the workers. 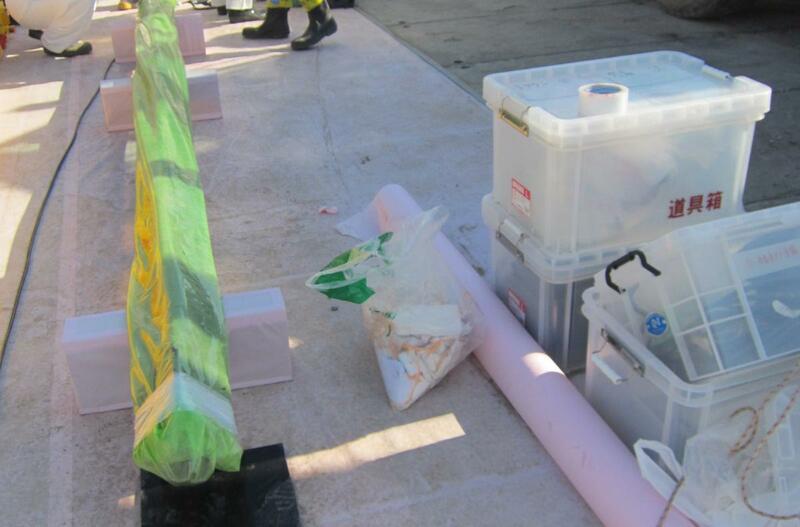 The company was contracted to put insulation around the pipes near Reactors 1, 2, 3 and 4 that carry contaminated water from the turbine buildings, so that the pipes wouldn't rupture or leak from the freeze. To explain it to you simply, everyone working for a nuke plant knows it is OK to be exposed up to 50 millisieverts per year. This 50 millisieverts limit is for each person. Then, for people like us, who work at the nuke plant all year round, 50 millisieverts is 50 millisieverts, and if we're exposed to too much radiation it won't last a year, frankly. [50 millisieverts] is up in 3, 4 months. So, unless we protect our own radiation exposure limit we cannot work at the plant and earn our living for one year. If we can't work at the plant, we don't have any other work. We've been working at the nuke plant for decades. Only at the nuke plant. So the thing is how we protect our radiation exposure [allowance]. If this radiation [allowance] is depleted, we can't earn our living. Do you understand? 50 millisieverts will just decrease. I'm fully aware that we shouldn't be doing this. I'm not forcing anyone who doesn't want to do it. Have I forced you to do it? All I'm saying is if you understand the situation and willingly do it for yourself, then please do it. I will do it because I want to protect my radiation [allowance]. If we don't shield [the radiation] with lead, we will lose our radiation [allowance] and there will be no more work. As I said, people who can work outside nuclear plants are OK. Don't need to do it, right? Those people who come to work for a short time and no need to work at a nuke plant afterwards. But we've been working all year round. One year, two years, three years, we work continuously [at the nuke plant]. If radiation exposure accumulates we cannot work at the nuke plant. Some Japanese bloggers are accusing the subcontractor and this executive for forcing the workers to fake the radiation exposure (even if it was technically a non-enforceable "request"). The executive allegedly explained to the president of the company that when he went to survey the location before the work, he was surprised at the alarm of his survey meter sounding off, indicating the rapidly rising radiation levels, that he wanted to make the radiation exposure levels look lower, and that 9 workers used lead covers once. NHK also says the Ministry of Health, Welfare and Labor is investigating the company. 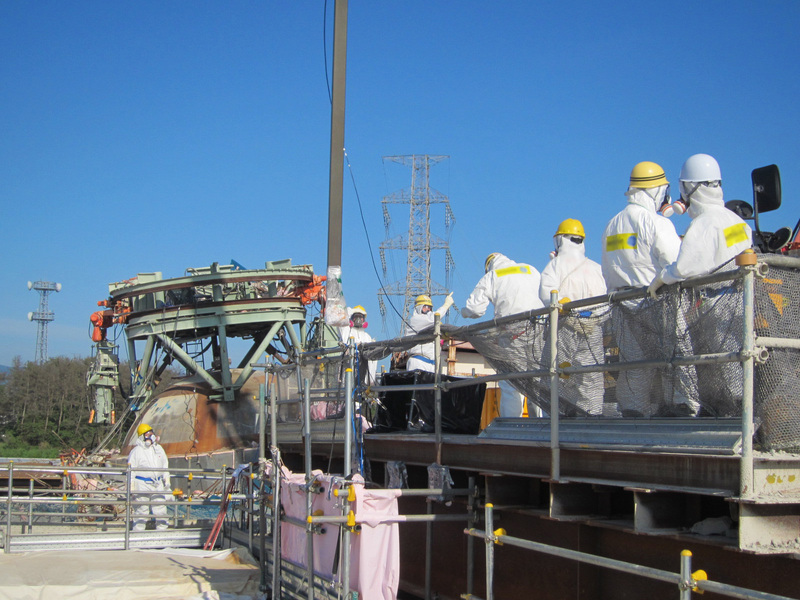 Two levels removed, TEPCO sits pretty with plausible deniability. TEPCO doesn't force any subcontractors to fake the radiation levels. The subcontractors themselves do, each deciding what is best for the company in order to secure the work for the workers and to get the job done. No one investigates TEPCO. No one will, as it is now practically owned by the national government. The nuclear power plants in Japan have been supported by the companies like this Namie-machi subcontractor. Without them, there would have been no nuclear power plant, anywhere in Japan. And now, without them, there will soon be no skilled workers at Fukushima I Nuclear Power Plant. And who is going to decommission all the other nuclear power plants in Japan? Decommissioning the plants cannot happen all at the same time. 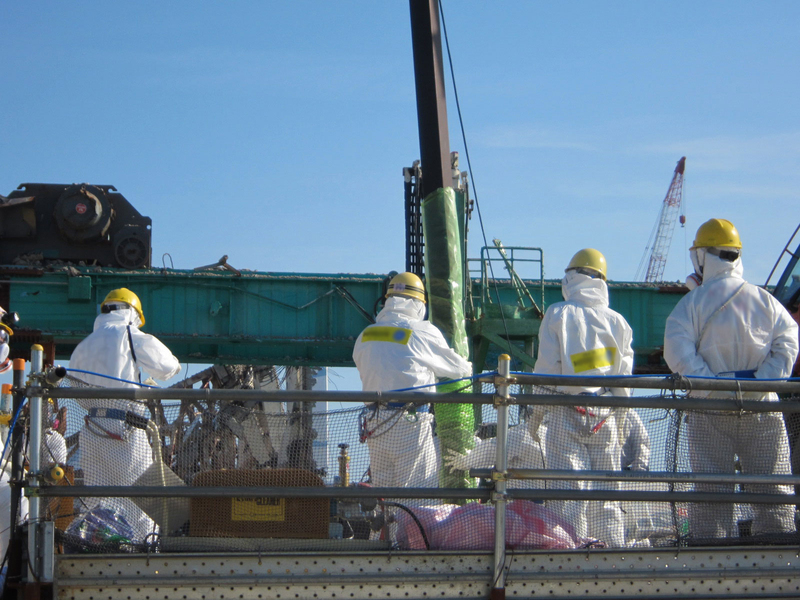 PM NOda declared the Fukushima I Nuclear Power Plant accident "over" in December last year, soon after these workers insulated the pipes around Reactors 1 through 4, wearing dosimeters covered with lead plates. And his government goes after this subcontractor. What a joke. What good does the government's austerity programs do? Well it will squeeze out enough money to pay to the bankers outside Spain. Spanish police fired rubber bullets and charged protestors in central Madrid early Friday at the end of a huge demonstration against economic crisis measures. The protest was one of over 80 demonstrations called by unions across the county against civil servant pay cuts and tax hikes which drew tens of thousands of people, including police and firefighters wearing their helmets. "Hands up, this is a robbery!" protesters bellowed as they marched through the streets of the Spanish capital. At the end of the peaceful protest dozens of protestors lingered at the Puerta del Sol, a large square in the heart of Madrid where the demonstration wound up late on Thursday. Some threw bottles at police and set up barriers made up of plastic bins and cardboard boxes in the middle of side streets leading to the square and set them on fire, sending plumes of thick smoke into the air. Riot police then charged some of the protestors, striking them with batons when they tried to reach the heavily-guarded parliament building. The approach of the riot police sent protestors running through the streets of the Spanish capital as tourists sitting on outdoor patios looked on. A police official told AFP that officers arrested seven people while six people were injured. The protests held Thursday were the latest and biggest in an almost daily series of demonstrations that erupted last week when Prime Minister Mariano Rajoy announced measures to save 65 billion euros ($80 billion) and slash the public deficit. Among the steps is a cut to the Christmas bonus paid to civil servants, equivalent to a seven-percent reduction in annual pay. This came on top of a pay cut in 2010, which was followed by a salary freeze. "There's nothing we can do but take to the street. We have lost between 10 and 15 percent of our pay in the past four years," said Sara Alvera, 51, a worker in the justice sector, demonstrating in Madrid. (Full article at the link). At least these people still have jobs. Spain's unemployment rate is over 24%, hitting young people disproportionately. The unemployment rate for people aged 16 to 24 in Spain is 51.5%, about twice as much as the overall average (which has always been the case in Europe, except Germany). Tokyo Shinbun has an article (7/18/2012) about a 36-year-old man from Futaba-machi, Fukushima who evacuated the town after the nuclear accident and now lives in Aichi Prefecture with his wife and a small son. Fukushima I Nuclear Power Plant is located in Futaba-machi and neighboring Okuma-machi. "Nuclear - Energy for Bright Future"
"Nuclear - Energy for Destroyed Future"
"Nuclear, Energy for Bright Future". It is a slogan displayed on the entrance to the main street in Futaba-machi, Fukushima Prefecture. 25 years ago, Yuji Onuma (age 36) came up with the slogan when he was a 6th grader. It was selected in the town-wide contest. After spending a year and 4 months as an evacuee and having convinced that "going beyond nuclear" is the way to go, he "corrected" his slogan on July 15 when he returned home temporarily. After the Fukushima I Nuclear Power Plant accident, he left town with his pregnant wife Serina (age 37). They now live in Anjo City in Aichi Prefecture. Futaba-machi called for a nuclear slogan in a public contest in 1987. Onuma's slogan expressing belief in the nuclear power plant building the future for the town, won. A sign made of steel was built with the grant money for municipalities with power generation facilities near Onuma's home, which was about 4 kilometers from Fukushima I Nuke Plant. He was proud. After graduating from college and worked elsewhere, he returned home at the age of 29. While working for a real estate company he built an all-electric apartment near the sign, and rented to TEPCO employees. He never doubted the "safety myth" that the town would prosper with the nuclear power plant. After the accident, the town was designated as no-entry zone, and all residents evacuated. Onuma was tormented by the fact that a normal life was taken away from the town, and was distressed every time the slogan was shown on TV. He blamed himself and regretted. But he thought he had the right to speak about the reality of [having] the nuclear power plant. He wanted to show to his one-year-old son that he was now anti-[or "beyond-"] nuclear. When he and his wife temporarily returned home on July 15, I accompanied them. Onuma, in the protective clothes, first waved a red card at the slogan, and shouted "Out!". Then, he held aloft a piece of drawing paper that he had brought in front of the sign. On the paper were two characters "破滅" (Destruction), which covered "明るい" (Bright) [on the sign], creating a new slogan: "Nuclear - Energy for Destroyed Future". Correction on the 26th year. and that's what is displayed on the top bar of my internet browser. Tens of thousands of antinuclear protesters gathered on Monday in central Tokyo in the largest rally since last year's Fukushima disaster. In Japan’s largest antinuclear rally since the disaster at Fukushima, tens of thousands of protesters gathered at a park in central Tokyo on Monday to urge the government to halt its restarting of the nation’s reactors. Organizers said 170,000 people filled a Tokyo square to sing songs, beat drums and cheer on a series of high-profile speakers who called for more Japanese to make their voices heard. TOKYO — In Japan’s largest antinuclear rally since the disaster at Fukushima, tens of thousands of protesters gathered at a park in central Tokyo on Monday to urge the government to halt its restarting of the nation’s reactors. Organizers said 170,000 people filled a Tokyo square to sing songs, beat drums and cheer on a series of high-profile speakers who called for more Japanese to make their voices heard. The police put the number at 75,000, still making it the biggest gathering of antinuclear protesters since the Fukushima accident last year. “To stay silent in the wake of Fukushima is inhuman,” the Oscar-winning musician Ryuichi Sakamoto told the crowd, which braved soaring temperatures to gather at Yoyogi Park. Polls suggest that public opinion is still divided over the future of nuclear power in Japan. But a unilateral decision last month by Prime Minister Yoshihiko Noda to start putting the country’s reactors back into use has angered many Japanese and galvanized the antinuclear camp. Antinuclear protests have gained momentum especially here in the capital, where tens of thousands of protesters now gather every week to shout slogans in front of Mr. Noda’s official residence. After the rally, protesters marched through some of the city’s busiest shopping districts, prompting curious looks from passers-by but largely maintaining a strict discipline that has come to characterize the antinuclear rallies in recent weeks. Rally organizers have gone to great lengths to project a friendly image in a generally conformist country where protesters of any kind are seen by many as fringe agitators at best and terrorists at worst. This perception is left over from mass protests in the 1960s and ’70s against a security treaty with the United States, during which rioters armed with pipes and makeshift gasoline bombs clashed with the police. At the weekly protests in front of the prime minister’s office, organizers cordon off family-only zones to urge parents with children to participate. They also ask protesters to cooperate with the local police and to go home at 8 p.m. on the dot. Organizers have also started issuing pamphlets with advice on what to bring (drinks and hand wipes on sticky days), advice for shy or first-time participants (no need to say anything) and guidance on what to do if fellow demonstrators start getting out of hand (politely ask them to calm down). An unlikely leader of the antinuclear movement is a fuzzy fictional character called Monju-kun, who has amassed a following on social networking sites like Twitter for his child-friendly jabs against the government’s energy policy. Monju-kun made a brief appearance at the protest Monday with a colorful stuffed costume. “The government is restarting our nuclear reactors, and that makes me sad,” he said to squeals from fans — many of them families with small children — waving Monju-kun posters. “If we’re not careful, we could have another nuclear accident, like a fire,” said Rion Nakajima, 5, who was clutching a balloon emblazoned with a smiling Monju-kun. “We decided to participate because we want the Japanese government to realize that any mistake it makes now will have serious repercussions for future generations,” said Rion’s mother, Kazuki. Nuclear power supplied nearly a third of Japan’s electricity before the Fukushima accident, but almost all reactors are now offline for checks or maintenance. Japanese leaders pledged last year not to restart any nuclear plant without local approval. But they apparently did not foresee the level of resistance that has since developed, and they have begun to push for plant reopenings, citing economic and security reasons. Last month, Mr. Noda approved the restarting of a reactor in western Japan. Others are expected to be put back into use in the coming months. Recent polls have shown that public opinion remains divided between those who argue that Japan should abandon nuclear power and those who warn of a crippling energy shortage. A majority favor more stringent checks of reactors. It is unclear whether the antinuclear protests can become a political force. There is still no significant Green Party in Japan, and the two largest parties say the country, for now, needs its reactors. Mr. Noda, who initially raised the ire of protesters by calling their rallies “loud noise,” said last week that he was fully aware of public opinion both for and against nuclear power. Takashi Uesugi, who says he is an ex-journalist and now a "hyper golf creator" (whatever that means), went inside the no-entry zone in Fukushima (I believe it was in May or June) with his dosimeters to ostensibly visit his favorite golf course in Fukushima. Mr. Uesugi, former New York Times reporter, created the bilingual (Japanese/English) video below, which is on his website, as a teaser for the longer, full version to be released later. In the early days of the Fukushima nuclear accident, he was more active, accusing the government and TEPCO for withholding the information about the accident, particularly about the "meltdown" of the reactors. On his visit to his favorite golf course, Uesugi also dropped by near Fukushima I Nuclear Power Plant. His dosimeter showed 106.87 microsieverts/hour. What's astonishing to me about the video than the radiation level (yes it is high) is that Uesugi visited a family who continues to live inside the no-entry zone because of the very old mother who is bed-ridden. The daughter, herself in her 60s or 70s, says even the doctors tell them it was a good choice to remain there, because her mother wouldn't have made it in the temporary shelter. But there is no water, no gas, no propane delivery, nothing. How do these people survive? Why should they suffer like this? Because of the arbitrary circle that the inept government marked on the map in March last year. But the daughter is reassuring the mother, "This is your house, you don't need to go anywhere." Many who saw this video are crying "TEPCO lies!" on Twitter because one of the monitoring posts at the plant on July 12 was only 9.3 microsieverts/hour, nowhere near 106 microsieverts/hour that Uesugi measured. That is an unjust accusation, though. TEPCO says on its webpage that summarizes the monitoring post data that the company did the thorough decontamination from February to April this year around the the monitoring posts MP2 through 8 in order to reduce the background radiation levels to better monitor the radiation fluctuations. The radiation level near the Main Building has been extremely stable around 220 microsieverts/hour.